“Akasyoubin” are kind of kingfisher and range over the forest and can be seen as a summer bird In Japan. Because they have a red bill like fire and red body, they are called “fire bird”. 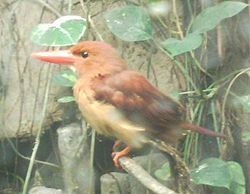 Then their English name is “Ruddy Kingfisher” and scientific name is “Halcyon coromanda”. Though their bodies and legs are red, they have the vertical lines of cobalt blue on waists. Their length is about 27cm. In Japan, there are two kinds of “Akasyoubin”: the “Halcyon coromanda major”, “Halcyon coromanda bangsi”. “Halcyon coromanda major” are typical kinds which can be seen in all parts of the country, while “Halcyon coromanda bangsi” come over to southwest archipelago as summer birds. Their habitat is usually forests, and differs from other kingfishers in that can be seen in forests far from the waterside. They feed on animals like a fish, frogs, and aquatic insects, and so on. They spawn from June to July, and lat about five eggs at one time. If you want to watch “Akasyoubin” in Kochi, you should go to “WANPARK KOCHI” in Kochi city or forests of Ochi town, Shimanto town in early summer. It is bigger than I thought.